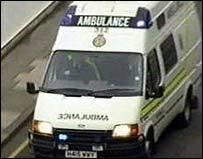 The number of emergency ambulance calls in England has hit a new high, figures from the NHS Information Centre show. There were 6.3 million 999 calls in 2006/07 - almost double the number of calls received 10 years ago. Despite the 6.3% rise on the previous year, crew maintained their response rate to immediately life-threatening calls within eight minutes. But union representatives warned that a higher number of calls was placing stress on paramedics. The number of immediately life-threatening incidents (termed Category A) in 2006/07 was 1.8 million - up 9.4% on 2005/06, when there were 1.6 million. The percentage of these attended within 8 minutes was 74.6% - the government's target is 75%. The number of patients actually taken to hospital as a result of a 999 call fell to 70% from around 73% in 2005/06, which is in line with the government's aim of reducing the number of patients taken to hospital for treatment, and instead treated at the scene. The target for serious but not immediately life-threatening category B calls - an ambulance vehicle capable of transporting the patient within 19 minutes, 95% of the time - was missed, but had improved on last year. Professor Denise Lievesley, chief executive of the Information Centre, said: "It is encouraging to see that ambulances continue to maintain their response rate to immediately life-threatening calls." Health Minister Andy Burnham said: "The ambulance service and their staff provide an excellent service day in, day out. "Those most at risk are being reached quicker - nearly 75% of Category A calls are reached within eight minutes - and more lives are being saved. "In the most recent patient survey, 98% patients were satisfied with the ambulance service - one of the highest ratings received by any NHS service." Steve Rice, general secretary of the Ambulance Service Union, said: "The workload has been going up constantly for the last 10 years, but with no significant increase in resources. "We would like to see an increase in funding for the ambulance service." He said many services were opting to use cheaper, unqualified ambulance staff to drive the vehicle, meaning only one rather than two trained paramedics would be onboard. He said this could potentially compromise patient care. Unison national officer Sam Oestreicher said: "It is not just frontline ambulance crews that are being stretched; essential support staff in the control room and elsewhere are all vital in ensuring the service can respond to the ongoing and significant escalation in the number of emergency calls." He said one of the reasons for the increase may be changes to out-of-hours cover. A new GP contract in 2004 resulted in nine in 10 family doctors opting out of providing round-the-clock care. But a Department of Health spokesman said: "There is no evidence that changes to out-of-hours arrangements have prompted the increase in 999 calls. "The start of the current trend pre-dates the changes to out-of-hours arrangements."